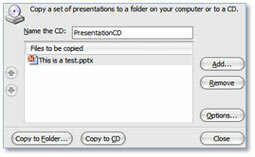 Alan Cooke looks at three more useful features of PowerPoint 2010. 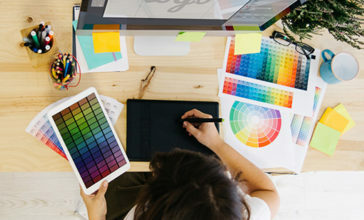 Using the mouse is indispensable these days but if you really want to work fast it is better to keep your fingers where they belong, on the keyboard! In the ‘old days’ I knew all the ‘F-key’ combinations to perform functions, remember those strips you could place over the ‘F-keys’? Typing and formatting was a lot quicker then and any ‘techie’ worth his salt will tell you ‘keyboard is king’. 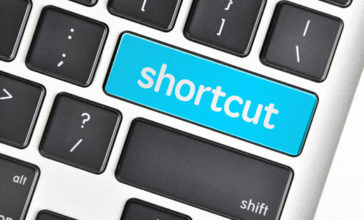 Problem is, there are just too many keyboard shortcuts to remember, never mind the desktop full of applications each with their own ‘F-key’ combinations. Is it ‘Ctrl+Shift’ or ‘Shift+Alt’ or worse Ctrl+Shift+Alt+what-was-it-now?’ Ugh! Using the mouse to navigate the menu/ribbon is the norm for most folk but I prefer to use the keyboard. Not only because it is quicker but in terms of ‘repetitive strain injury’ it could well be the better option. It seems Microsoft Office 2010 has this in mind because the new ribbon layout presents the appropriate key in a vastly improved way, as can be seen in the image above. Once you have clicked the Alt key the ‘KEY letter/number’ pops up and stays there. Much better than the old style ‘Alt+Key’ concept. Of course, not everything is selectable this way but it does speed things up considerably. Takes a while to break the mouse habit though – sigh! Presentations are for sharing, no question. 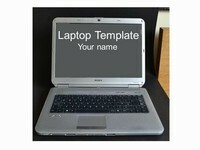 Whether a business meeting in an office using your laptop and projector or further afield such as email or CD packaging. I especially like the ‘pdf’ option. Sure it’s not a true ‘presentation’ but it is very handy and unless the recipient has a ‘pdf’ editor your masterpiece will remain intact. Of course, one can password protect ‘pdf’ documents if security is an issue. The Adobe ‘pdf’ file format is the de-facto file format for electronic transmission and viewers are freely available. Music as a background to a presentation can make all the difference. As long as you are aware of copyright issues and do not infringe on licence rights, etc. adding a suitable soundtrack can add just that little bit extra to the overall mood of your show. In previous versions of PowerPoint there were limits to the size of the audio file one could embed within the presentation. 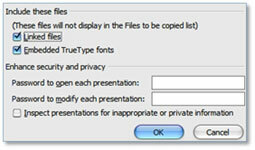 This restriction necessitated supplying a separate file with the ‘ppt/pps’ file itself. Now with 2010 it is a relatively easy procedure to embed and save audio files. Once you have set up your show by embedding your audio clip (and this could even include video clips) follow these steps. This will open the following screen to the right. This will open the dialog box enabling you to name the CD, include and arrange the music files, and, very important, embed the fonts you use. 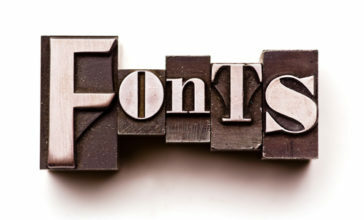 This is important because the end user may not have the fonts you chose for your presentation. You also have the option to set separate passwords for both presentation and modification. The package options can be seen here. Of course you can simply save your show as a regular presentation just remember to save with your fonts embedded. Oh, and don’t forget to compress your images/audio/video if file size is a concern. When you select a portion of text watch for the faint appearance of the most common formatting options. Here it is fully displayed. 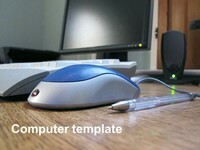 Once you have selected the text, watch for the format options to fade in and move your mouse over the formatting menu. Choose your options and that’s it. The best bit? Like the regular formatting bar, the changes are displayed in ‘real time’ so you can see what the result will be before committing. That’s it. Please feel free to add your comments at the bottom of this article. Everyone has their own particular favourites. As I said in my second tip… Sharing is Caring. I need help. I have a page in my presentation that is have multiple copies of three or four words that flash across the page (appear/disappear). I would like one word to remain at the end while the others do not appear. Does anyone know how I can do this. Why not Wow your audience with a polling system? 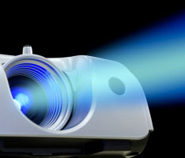 These days a simple PPT add-in along with small light weight keypads can get your audience truly involved.